All Bee Furniture is hand-crafted from start to finish by Mark Schilling in Nanaimo, BC on Vancouver Island, Canada. I am a small-scale beekeeper with a passion for both bees and fine woodworking, and a member of the Cowichan and Comox Valley Beekeeper's Clubs, as well as a member of the executive for the Nanaimo Beekeepers Club for the last few years. I own and run numerous apiaries (bee yards) in the Nanaimo area, and I own about 20 colonies while helping a handful of beekeepers maintain their own hives. 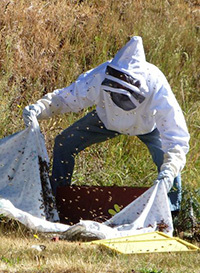 A Certified Bee Master, I enjoy furthering my study of honey bees and continue to increase my knowledge base as I expand into some of the more technical and specialized aspects of beekeeping, including queen rearing and assisting with scientific research programs. I also hold numerous field-days during the summer, and teach introductory to mid-level beekeeping courses in the early spring. I have chosen to carefully manage a relatively small number of colonies and ensure all of my bees are healthy and well cared for, rather than expand to a larger operation at the risk of sacrificing bee health and the quality of my honey (I have worked in numerous commercial apiaries and have no desire to go that route). I do offer for sale a limited number of robust, locally-raised nucs (small colonies) each spring, from my strongest overwintered colonies, on both medium and deep frame formats. I also offer a limited number of strong, healthy queens over the course of late spring and summer. I tend to select my breeder colonies based on gentleness (no-one likes working with agressive bees! ), honey production, and hygienic behaviour, in that order. Mark enjoys all aspects of beekeeping, including capturing the occasional swarm, when he's not busy in the workshop. Mark enjoys teaching beekeeping classes each spring. 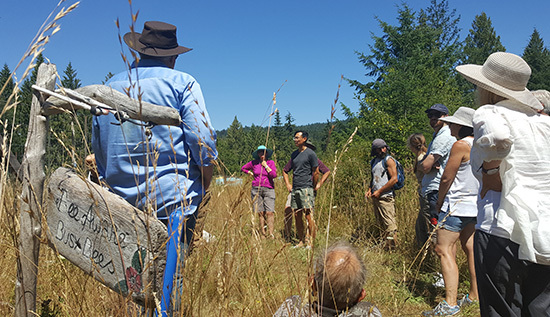 Whether you'd like some hands-on experience or just want to observe from a distance, field-days such as this one can be an excellent opportunity to learn more about bees! When my wife Christine and I first introduced bees to our North Nanaimo suburban backyard, we were somewhat disappointed with the quality and appearance of commercially-available bee hives and products. We wanted our hive to be more than just a home for our bees - we wanted something that would add to our landscaping and be an attractive backyard feature. As an avid part-time woodworker, I went to work at creating some home-made hive bodies, bottom board and outer cover. A new friend and fellow bee-keeper noticed my craftsmanship and while asking to have me build him a few pieces, remarked that it was 'furniture quality'. As I got a few more requests for parts, Bee Furniture was born. All of our parts are hand-crafted from locally-sourced pine, spruce, cedar and other woods. We hand-pick the best wood we can find: not only strong and straight, but also with interesting features in the grain of the wood that will make each piece unique. While tight knots and small burls can be more difficult to work with, they add character and beauty to the end product. Each piece is hand-crafted and sold fully assembled, sanded, and finished with your choice of weather-proofing (paint or hand-rubbed gel-stain and tung oil finish for a more natural look). All products are ready for you to take home and use immediately - no further assembly or finishing is required! To learn a bit more about what makes Bee Furniture better, click here! We invite you to peruse our web site, and if you have any questions about our products, how we build them, or what they're for, we encourage you to contact us by email or phone. We are happy to work with you to design and build some quality furniture for your bees, whatever your requirements! If you're as passionate about the look of your hives as you are about the bees within it, feel free to request any special pieces. Whether you prefer straight grain, knotty pine or custom red cedar, we'd love to build something special for you and your bees!